If you have Mexican ancestry and research those family lines, like I do, you undoubtedly spend quite a bit of time on FamilySearch. 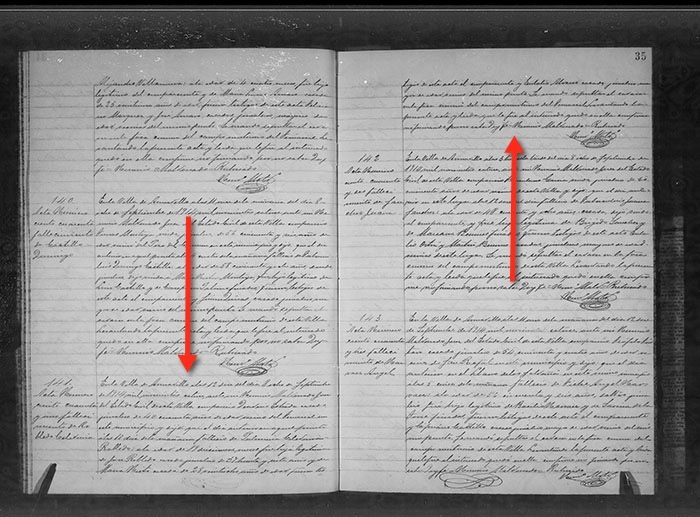 FamilySearch is the largest provider of digitized Mexico genealogy records in the world (the same is likely true for microfilmed records), and they make these records available to the public for FREE. No paid subscription required. 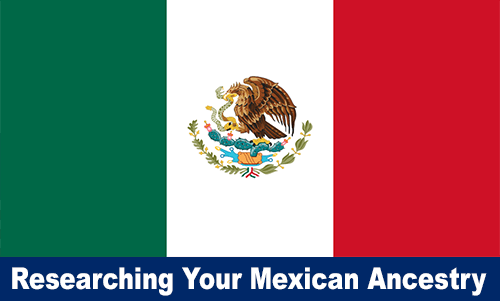 But if you use their Search feature to look for records pertaining to your Mexican ancestors and collateral relatives, you may be missing out on these very records. Aside from the possibility that you misspelled a name, or that mistakes were made by transcribers or indexers, chances are pretty good that the particular record sets you seek just have not yet been indexed. And if they have not been indexed, those records are not yet searchable. At first glance, if you land on the Search Records feature for FamilySearch, it would appear that you can search within their collection of Mexico records. And you can…assuming those particular record groups have already been indexed. If the records have not been indexed, they cannot show up in search results. The following example is from my own family research. My great-grandparents Jose Robledo and Maria Hermalinda Nieto married in 1908 in Armadillo de los Infante, state of San Luis Potosí, Mexico. They immigrated to the United States on 27 October 1915 via the Laredo, Texas border entry point. From U.S. border crossing records and Mexico civil registration records, I know that the couple gave birth to at least three children while still in Mexico. 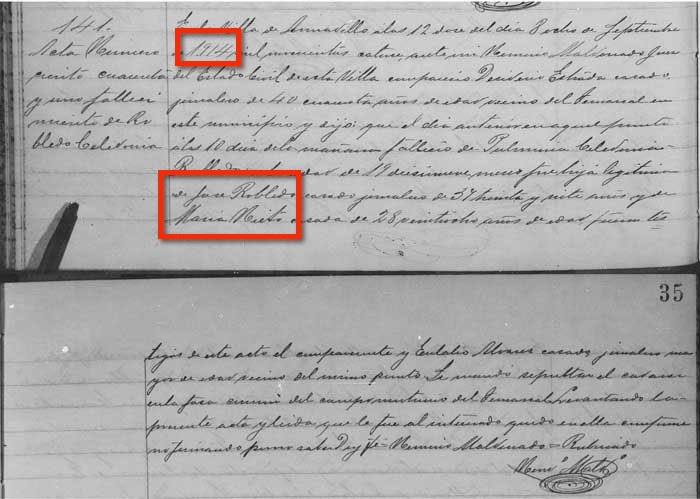 Yet searching on their surnames (see screenshot below), for civil registration records in the state of San Luis Potosí, between the years 1905 – 1916 yields no civil birth registration records for any of these three known children. 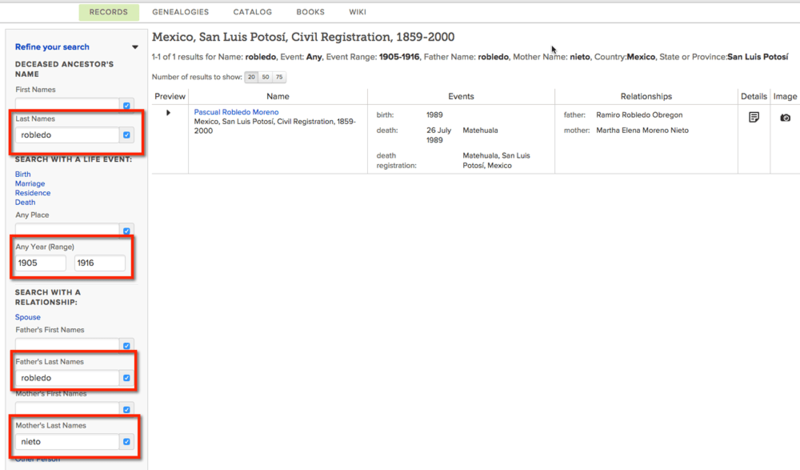 Search results from San Luis Potosí, Mexico, Civil Registration records, when searching for children born to my great-grandparents’ surnames. Click image for a larger view. I imagine many family historians who are new to working with Mexico records give up at this point, simply assuming FamilySearch just doesn’t have the desired records available online. Because that was me…even up until a couple years ago. Granted, it is very possible that FamilySearch does not have the records at all, online, on microfilm, or in print. But it is more likely that they just have not indexed those records yet. Which is indeed the case. 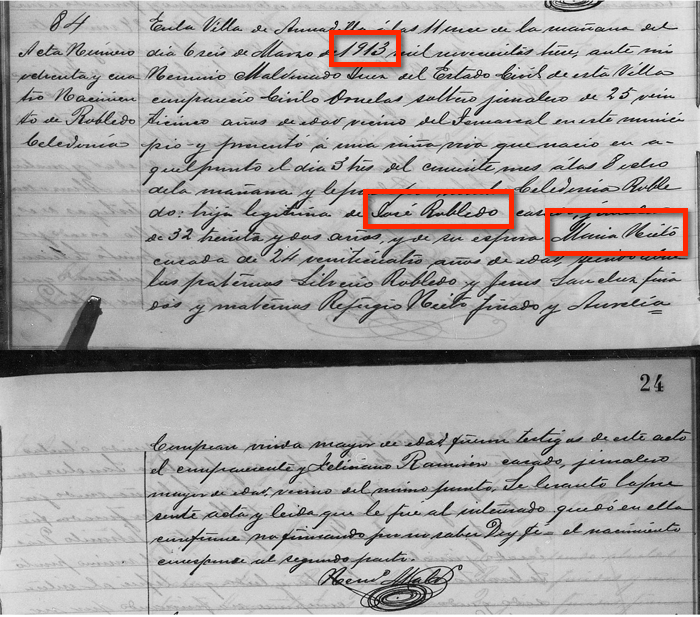 The examples below are digitized records for one of the known three children born to my great-grandparents back in Mexico: a 1913 civil birth registration, and sadly the 1914 death registration for the same female child. I found these records, and learned about this child–a sister my grandfather never knew, and probably never even knew about–by painstakingly browsing image by image, page by page, through the non-indexed, non-searchable, browsable-only digitized civil registration records for Armadillo de los Infante, in the state of San Luis Potosí, Mexico. Just like we have to do when using microfilm. 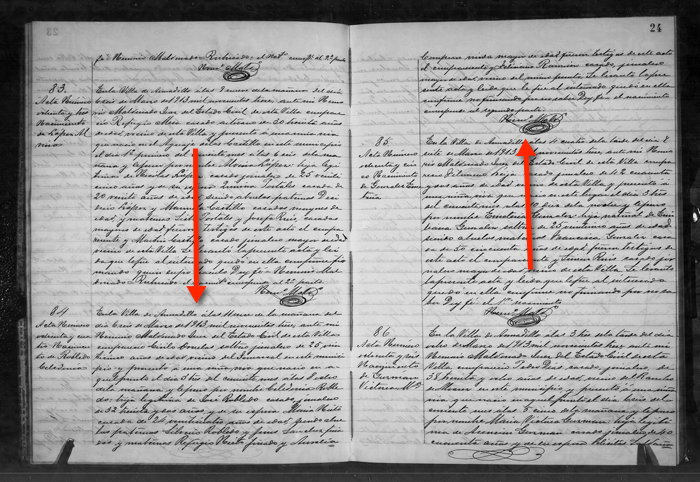 The annotations I show in red markings for both records clearly show that digitized records exist referencing the terms I used above in my attempted search. Both records identify Jose Robledo and Maria Nieto as the parents. My search query looked for Robledo individuals born to a Robledo father and a Nieto mother. The birth record is dated 1913, and the death record is dated 1914. My search query looked for records dated 1905 to 1916. So don’t give up if your attempted searches do not uncover records for your Mexican ancestors! It just takes a little more digging and patience to find those valuable records. Not sure how to access those non-indexed, non-searchable, browsable-only digitized records? We will walk through that in the next blog post. Wondering what civil registration records are and how to read them? Watch for future posts. I am teaching “An Introduction to Researching Your Mexican Ancestors” at the Texas State Genealogical Society’s 2015 Family History Conference at the end of this month. My intro session is followed by two more advanced classes in the Hispanic Genealogy track on Saturday, October 31st. Register on the conference website. Genealogy sources are cited in Evidence Explained format. hanks for information. I need all the help I can get. The family has tried for years to get information on my grandfather who was born in Zacatecas in 1903 to 1905 range. I look forward to more tips. Thanks for stopping by! I think the tips I am planning will indeed help you make some progress on your Mexico lines. I have come to a stopping point on the search for my great grandmother. Her name was Luisa Ubeda married to Cresencio Huerta found their kids but that was all I could fine on her. I found the name in 1870 census but not sure if that is her. Don’t know where to look anymore. It seems that she vanish from all record. Any tips on how to keep searching? Thanks for a terrific blog post! I only recently realized that (non-indexed) digitized Mexico images are available online. What a boon this has been to my research. I found 12 grandparents in about two hours the first night I dove into the records. Since then, I’ve continued to make new discoveries. Though I have to say wading through the records is not for the faint of heart (or those of us with weak eyes and bad Spanish!) BTW, I found your post via Cyndislist.com and it really resonated with me. I had done a blog post around the same time chronicling my own foray into the digitized records: http://genieresearch.blogspot.com/2015/10/doce-abuelos-en-dos-dias.html. I sure hope others find your blog post so they can learn what a treasure those digitized records are!